The back forearm needs to align with the putter shaft. The big reason I figured now would be a good time to write about putting setup is Tiger’s change of putters, where he moved from the same old blade putter to a mallet. This is a newsworthy change since he’s been with the Scotty Cameron putter forever, but more importantly, I noticed while watching him the second round at the Quicken Loans National, is that his putting stance changed as well. The argument is that having the arm aligned takes wrist movement completely out of the equation. If you’re looking to feel what I’m saying, take a putter, bend those wrists to create a giant angle between the forearm and putter shaft, and try to keep the putter head stable. You can’t. The less movement the better. Another thing to think about is why people switched to anchored putters. One long shaft takes wrists out of the equation, similar to the affect forearm alignment does. I’ll also say that the majority of the people reading this already have the forearm shaft alignment, because it’s the natural, athletic way to handle a putter. If people can come up with a reason that not having the forearm shaft aligned is better, let me know. I want to see what you can come up with to disagree. Remember though, setup isn’t the most important part of putting. Attitude is. I’ve written before about how the best mentality over a putt is to expect the putt to go in, and be surprised if it doesn’t. It doesn’t matter your setup, but if you don’t think the ball is going in the hole, you’re toast and will never be a great putter. One thing to remember here is that camera angles sometimes make it difficult to know fore sure what the arm alignment is for the players. Google image searching only gets so far, but hopefully people agree with what these pictures show. 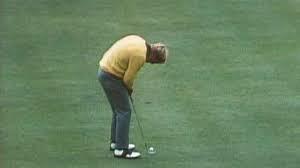 I’ll start with Jack Nicklaus, who, as you know, has quite the odd overall setup, but that back right forearm goes right up where his putter shaft is aligned. It was hard to find a picture of him exactly from behind, but here’s one of him right before making the winning putt at the British in 1970 at St. Andrews and launching that putter in the air with two hands. Brad Faxon was another initial thought as he’s considered the best putter these days, and has credit for being the putting guru. Searching for his setup brought me to this picture in a forum, which includes Aaron Baddeley, who is considered the world’s best putter by this random British golf blog. Sign up here to get the weekly preview in your inbox. Putting your email address means you'll sign up for a weekly newsletter previewing everything you'll want to know about the upcoming week's PGA Tour event. Course info, tidbits about the field, who and what to watch out for, and even some weekly fantasy player picks for your favorite fantasy golf site along with other golf related articles you're guaranteed (maybe) to find interesting. Just think of this as following an account on twitter, except it's over email, the account only tweets once a week, and you don't have to actively waste time looking at all the other garbage tweets.